Jacinda Ardern fronted up on the first Newshub Nation of the year. She was asked about the blast of criticism following the release of the Tax Working Group report. She appears to blame NZ Herald columnists for giving the report negative coverage – but she and her Government seemed woefully unprepared for discussion following it’s release. Yeah, and the Greens are all on board with the capital gains tax. It’s Winston Peters who could prove the hurdle. And you yourself, pre being elected and pre being in this coalition situation have talked about maintaining a right as a leader to make sure the tax working group reports back and that you’re able to— you can enact whatever it say. And, you know, that’s your right, and so that right might be lessened. I don’t know how that’s been characterised. Of course, we all campaigned as individual party leaders. And everyone will have seen some of the statements I made as Labour leader. I’m now the Prime Minister in a coalition government, and I have three parties I need to build consensus with. And, actually, that’s what I just have to do day-to-day. And the tax working group report — it’s no different. But having said that, obviously now we’re in a process of just allowing the public to see and the public to have that debate, and I think we should. You know, one of the things that I do think is unfortunate, though, is that, you know, there is a large group of New Zealanders, particularly young New Zealanders now who actually, if their aspiration has been homeownership has just become harder and harder. There’s a group of New Zealanders who don’t have columns in the Herald, who might not be having a chance to have their say on this. We need this debate in New Zealand, because we’re one of only a handful of countries in the OECD that doesn’t have this form of tax. And so let’s debate it. And you’re leading it. You’re part of that debate, obviously, and your language is being scrutinised. Earlier this week, you seemed to be softening your language about, you know, having concerns about farmers and small businesses. So does that mean that you’re going towards where Winston Peters might sit? It was an acknowledgement that in all of the debates we’ve had on capital gains. It often has been quite heavily focused in the commentary around, for instance, investment properties, and less so in the space where the tax working group went, which is broad-based and covering additional sources of income, and so small businesses in particular have been brought into that debate. And message was I hear that there’s a lot of arguments for and against, and I hear that. Because that was a new part of the debate, I didn’t want anyone to think that we weren’t considering all of the issues around that area. So you say that, you know, you’re not going to reveal your position until you’ve reached consensus with your partners. That’s two months away. Are you concerned that this is creating uncertainty? It’s a debate that Ardern and her Government started very poorly on, leaving a huge vacuum for concerns to be raised in. The lack of any clear plan has enabled uncertainty to grow, and her waffly response here is unlikely to help at all. Capital Gains Tax has been proposed in Labour policy for many years. It helped defeat Labour in 2014. as a result Andrew Little dumped the policy. Ardern raised it again in the 2017 campaign but rapidly backtracked when it was slammed as electorally toxic. 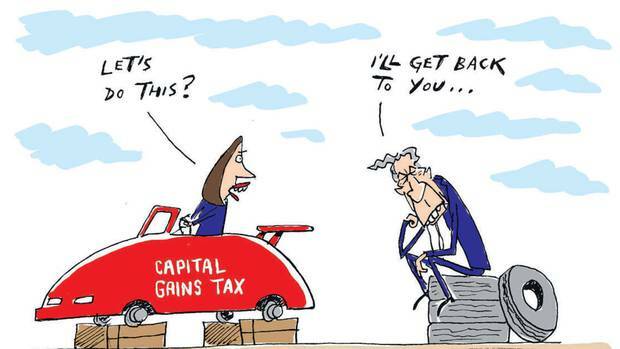 Once in Government Ardern handed the decision making over to ex-Finance Minister Michael Cullen and the working group, but a year later, after CGT was proposed in the report, Ardern seems to still be floundering on how to handle it. She may well have a problem with Winston Peters. whose support she needs. But she also has a problem with her own handling of tax reform – the right say she’s proposing too much, the left say she isn’t considering enough reform. Rather than some semblance of getting things just right Ardern looks like she is poking at lumpy CGT porridge with a long toothpick. Prime Minister Jacinda Ardern delivered a defence of the proposed capital gains tax plan today, noting the vast majority of Kiwis would be better off. She also said the concerns of farmers and small business-owners were “top of mind”. The tax working group, chaired by former Labour finance minister Sir Michael Cullen, recommended the Government introduce a new broad-based CGT on rental properties, land, businesses, and shares, paid at the income tax rate. The family home would be excluded. This would raise roughly $8.3 billion over the next five years, but that could be ploughed back into the hands of taxpayers through a suggested income tax cut, and another tax break for KiwiSaver accounts. This would deliver a tax cut between $420 and $595 a year for almost all taxpayers. Ardern said that because of this tax switch most Kiwis would come out financially ahead. “In Australia only 4.7 per cent of taxpayers paid capital gains tax in 2015. Over 95 per cent of Australians pay no capital gains tax in any given year,” Ardern said. Ardern also sought to downplay the impact of the tax in general, saying it would only affect four per cent of the tax base when fully implemented in 10 years. “It is far from an attack on the Kiwi way of life,” Ardern said. She said the purpose of her statement was to make sure that the debate was based on facts, and declined again to endorse the actual plan. If you thought the Government (well more correctly the Labour Party) is hell-bent on committing political suicide you’d be wrong. The Beehive is reeling and sitting in the top office of the ever diminishing building Jacinda Ardern’s in a state of shock at the reaction to the Taxation Working Group’s report. Tax had been talked about so much they decided to hand it over to the Tax Working Group, led by Sir Michael Cullen, who knew better than to ever suggest a capital gains tax, correctly appreciating the political danger of it. Ardern must have been having a nap during the two campaigns Labour fought and lost because of it. Now she’s wide awake to the political damage it’s doing to Labour, spending the first six minutes of her post-Cabinet press conference yesterday giving us a lesson on how to report it accurately. Ardern was at pains to ensure the students understood her lecture. The debate should be about a fairer and more balanced taxation system and is most certainly not an attack on the Kiwi way of life as some have claimed. In her setpiece lecture she told us small business and farming are crucial to the economy and she wanted to be clear, she said referring to her notes on the lectern, that the effects on them will be at the top of her mind when the options are assessed. Surely that, coming from the captain, leaves room for a sigh of relief. As the lesson was drawing to a close she told us the bleedingly obvious: that the tax would be paid only when a capital gain is realised, or when an asset gets sold, so there won’t be an ongoing impost. Until you’ve sold your next asset that is – and the capital gain on any asset won’t be assessed until after the law takes effect, most likely in April 2021. So the nest egg you’ve realised up until then won’t attract the captain’s call. By and large, Ardern declared, the tax system was working well. Yeah well if it ain’t broke – don’t fix it. I wonder if Soper has a property nest egg or two he is worried about being taxed on. It has been claimed that baby boomers will be hit the hardest by a CGT as many have invested in property aas a retirement fund. I have doubts about this. If Labour get NZ First to agree to support CGT legislation, and if Labour get back into Government later next year, the CGT will only come into force in 2021. If Labour follows TWG advice and don’t make the tax retrospective, only capital gains from 1 April 2021 will be taxed. So most of the capital gains scored by baby boomer investers, up until then, should be safe from tax. If they sell up soon they will be sweet. It will be longer term property investors of the future who would pay the bulk of Cullen’s CGT, while baby boomers bask in their gains untaxed. Chairman of the Tax Working group, Michael Cullen, was interviewed on Q+A last night on Capital Gains Tax and water. He was also interviewed on the Nation on Saturday. Sir Michael Cullen says there’s currently under-taxation at the top end of the income and wealth scale, and under his working group’s recommendations “people who have substantial capital assets in one form or another” would end up paying more. The Q+A panel on Cullens interview and tax. Michael Cullen, ex finance minister and now chairman of the Tax Working Group, will be interviewed on Newshub Nation this morning at 9:30m am (repeated Sunday morning 10 am). Following the release of the Tax Working Group’s interim report, Simon Shepherd sits down with its chairman Sir Michael Cullen to look at how tax changes could increase income equality and help the environment. The contentious hobbled CGT should be a talking point. The Government has given the Tax Working Group a prod along after it stopped short of reaching a recommendation on the merits of a broad-based capital gains tax in its interim report. It set out two models for what a broad-based tax on capital gains could look like in its interim report published on Thursday. Chairman Sir Michael Cullen said “the key issue” it had looked at was tax on capital income, but said it was not a “no brainer”. Finance Minister Grant Robertson and Revenue Minister Stuart Nash immediately released a letter they had sent to the TWG. The letter asked the TWG to “consider a package or packages of measures which reduces inequality, so that New Zealand better reflects the OECD average whilst increasing both fairness across the tax system and housing affordability”. The ministers also asked the TWG to examine which of two models for taxing capital gains that the TWG considered “would be best to ensure the tax system was … fair and balanced”. A source close to the TWG said the letter sent “a strong signal” about the Government’s desire for a broader capital gains tax. Though it may not have settled on an answer yet, yesterday’s interim report by the Tax Working Group was crystal clear about the problem: we have a tax system that does very little to enhance fairness and reduce inequality. The need to restore fairness runs like a silver thread throughout the working group’s analysis. Hence one of its preferred options is to tax nearly all the gains that people make from selling assets. …it would also help reduce inequality, because these so-called capital gains will be largely the preserve of the very well-off. Indeed, many of these people have become adept at disguising their income as capital gains in order to avoid paying tax. There are, of course, some downsides to introducing a thorough tax on capital gains. It creates more reporting requirements, and could encourage people to hold on to assets for longer. But these seem like minor problems when set against its major benefits. The spectre of a capital gains tax on residential property sales and other substantial assets has loomed large over the New Zealand tax scene for about fifty years now. Government is a little different, but the outcome seems likely to be the same. While this time the Government has left open the possibility of a capital gains tax, it is the Tax Working Party that looks likely to rule it out, saying the issue is ultimately a political one. And, given the Government’s commitment not to introduce such a tax before it gets a specific renewed electoral mandate, the prospects look as distant as ever. Very few governments win elections promising to introduce more taxes. All of which raises the question as to why the capital gains issue keeps getting raised, especially since the arguments in favour from both a revenue gathering and efficiency perspective are not that strong. Advice I received when Minister of Revenue was that it could be over a decade from the time of introducing a broader based capital gains tax until it produced any significant revenue gain for the Government. Also, it has been long accepted that the family home would have to be exempted from any such regime, further diminishing its likely impact. Even in the rental sector, the impact would likely be negative for tenants, with landlords boosting rents to offset any negative tax impact when those properties are sold. … the application of a capital gains tax to other substantial items would be just as fraught, as items will appreciate over time at different rates, while some will depreciate. The administration of such a tax will impose additional strains and complexities on an already struggling tax system for not much revenue gain. When tax policy moves too far into the area of engineering income redistribution or social equity complicated issues invariably arise at the margins, which the tax system, by virtue of its blanket approach, is not well designed to cope with. All of which means that the Government would do far better to focus its ongoing attention on ensuring that the greatest amount possible of all taxes currently levied is collected before embarking on the imposition of new or additional taxes. For all these reasons it is time to bury the capital gains tax argument for good, and focus afresh on tax policy that works, rather than just feels good. One thing is clear after this week’s tax report – tax could make or break the Government at the next election, and a capital gains tax (CGT) will be a defining issue for the relationship between Labour and New Zealand First. The tax blunder last time taught Jacinda Ardern and then finance spokesman Grant Robertson that the “how” of progressing a policy is as important as the “what”. Capital gains tax has been an integral part of the post-Clark Labour story. In a sense, Robertson owes his job as Finance Minister to it. It may be that New Zealand First sees CGT as such a defining issue for Labour that it is obliged to support it as an article of good faith. Both parties will also be mindful of the integrating effect of the policy on the Coalition. Because the capital gains tax would not take effect until after the election, it would bind the Coalition partners, Labour and New Zealand First, closer together and require Peters and Ardern to campaign jointly under their tax policy. That will fundamentally change the dynamics of the next election, whatever the merits and disadvantages of a capital gains tax itself. Michael Cullen, chairman of the tax Working Group, has confirmed that the interim report due to be released this month will make no recommendations on a Capital Gains Tax. The Tax Working Group will not recommend whether or not New Zealand should get a broad-based capital gains tax, in an interim report due out this month, chairman Sir Michael Cullen has confirmed. Stuff had previously reported that any recommendation on the controversial tax would be deferred until the working group publishes its final report in February. Cullen said on Wednesday that he was “happy to confirm that”. Finance Minister Grant Robertson has played down the implications, saying the work the Tax Working Group was involved in was “always supposed to be a two-stage process”.It seems remarkable that one of Labour’s most prominent policies and their big tax policy, CGT, would not be addressed on the first report. Surely for a tax package to make any sense it would include the major components, in general terms at least. As Amy Adams says, this won’t do anything to address uncertainty in the business community. It seems to confirm that what the TWG would like to recommend on a workable CGT is outside the parameters given them, or Labour have indicated is not something they want to hear at this stage.